The Netherlands approached, arrived, disappeared then suddenly we were back again! Since our last blog we have cruised 220 kilometres further north, now at Weesp, just south of Amsterdam. This took us from Wallonia (French-speaking) Belgium (at Liege) into the Netherlands (at Maastricht) and then back into Flanders (Dutch-speaking) Belgium on the Zuid-Willemsvaart before it entered the Netherlands again. All a bit confusing.. you can see this area online here. 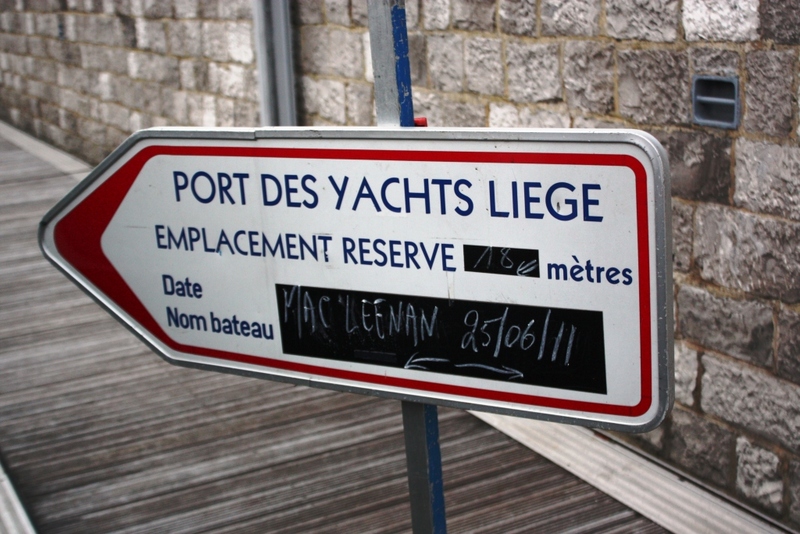 At the beginning of July as we entered the city of Liege in Belgium we encountered some major accessibility challenges. Mooring was in fact a breeze as we immediately found our ‘reserved’ spot just inside the harbour walls where there was a big sign with our name ‘MACLEENAN’ (almost right) written on it. Endellion moored at Liege at the river end of the long narrow harbour. Here we found we had a very nice wide floating pontoon at a perfect height to get off the boat. But as we went along this pontoon we found it ended after 100 meters or so with three steps up to a fixed stone jetty (we were eight metres or more below road level). Accessing this section was a very tricky challenge but wasn’t the biggest issue as another 150 meters along the stone jetty we arrived at the harbourmasters office (Capitanerie) and street level but they were at least 16 steps above us. Determined to assist, the harbour master found two five/six meter long heavy metal gangway tracks and with the help of several of our very kind fellow boaters lugged these into position at the far end of the other side of the harbour, where there were only six steps, to build the port’s first-ever wheelchair ramp. A steep and scary tack, now about half a kilometre from our boat (being on the other side of the long narrow harbour), but it worked..for a once only exit at this port. 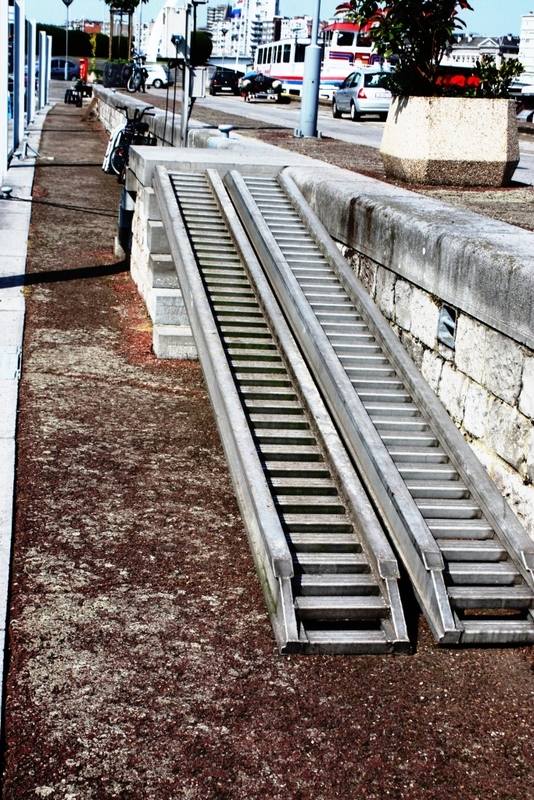 The huge ramp built (temporarily) for Stewart at Liege harbour. Way too difficult to attempt twice! Once on land it was off to the Tourist Information Office which boasts about all the facilities the city offers for travellers with disabilities; tours for the deaf and for people with visual impairments etc, etc. However there’s a big step at their door and worse still, they didn’t seem to think they should make it wheelchair-friendly, “impossible, impossible!”, we were told when suggesting a short portable ramp would easily solve the problem. Undaunted we set out to explore the city, starting with a look inside the Liege Cathedral and its cloisters – there we saw and learnt far more than we had ever expected. 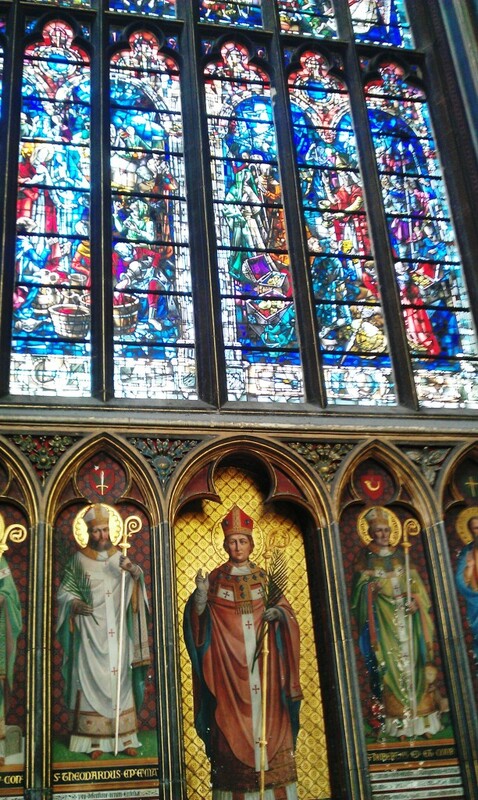 Beautiful stained glass windows and murals at the Liege Cathedral. A sign on the cloisters announced the entrance to the treasury. We had no idea what a cathedral “Treasury” was, so asked one of the wardens to give us an idea of what we were about to see. Stewart agog at the Treasury at Liege Cathedral. 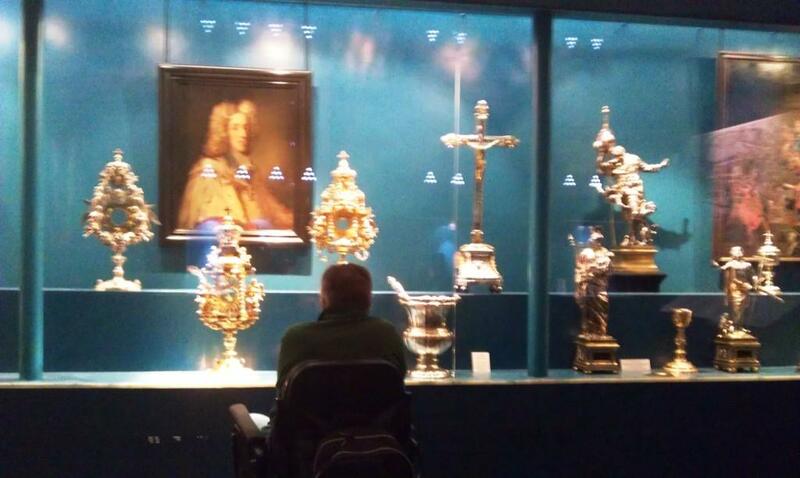 In perfect English, he explained we would be able to inspect the cathedral’s collection of priceless relics. 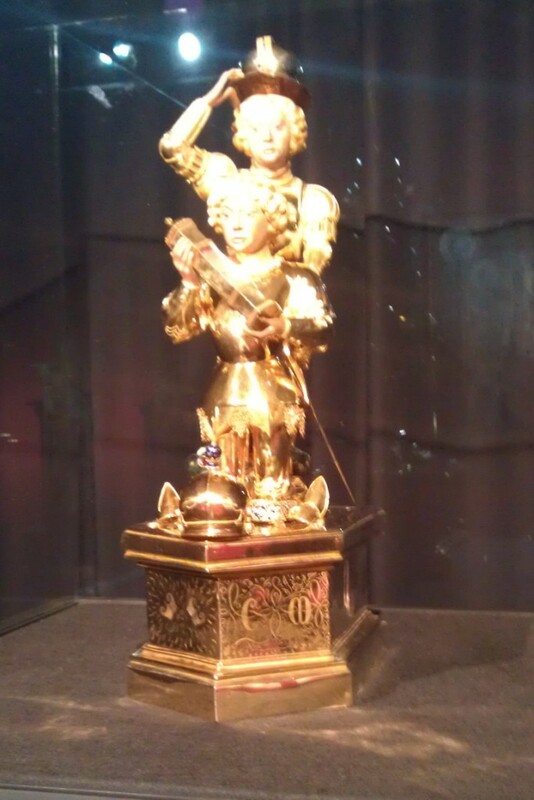 Solid gold relic showing the Duke of Burgundy kneeling before St George, holding an encased 'finger'. 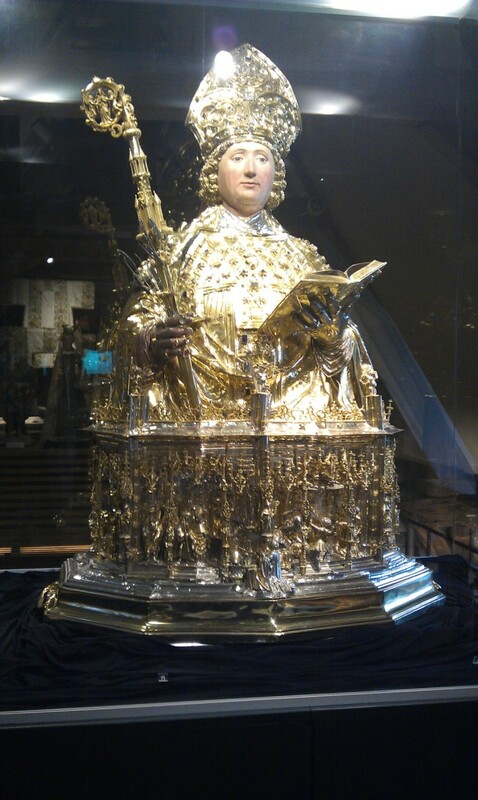 Charles the Bold, Duke of Burgundy, who along with his “Good”, “Silent” and other family members, we’d already learnt of in Kortrijk, Belgium and Dijon, France, had presented an early bishop of Liege with a solid gold reliquary (circa 1470) depicting the Duke kneeling before St George holding a relic of St Lambert’s finger (apparently)! There was ivory, parchments, tapestries and on the top floor at the end of a long red tunnel, a life-size silver St Lambert, completely covered in jewels. 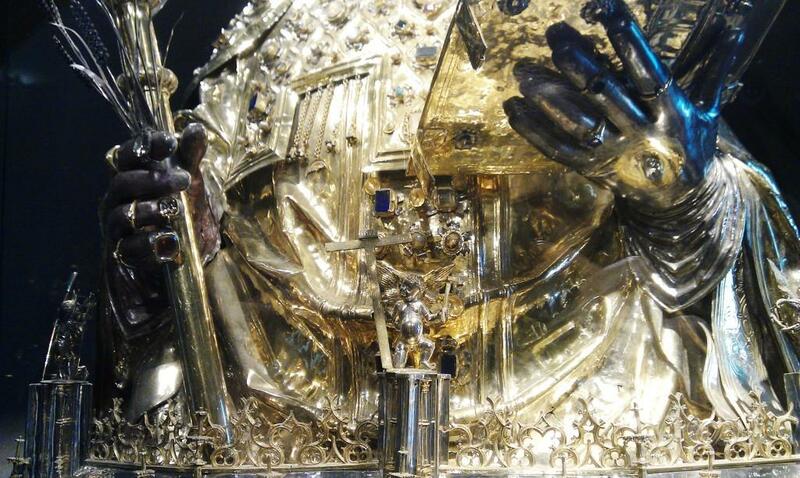 Look closely here and you will see the jewels on St Lambert's fingers, and encrusted on his clothes. St Lambert made of solid silver and studded in jewels. Under all the silver we were informed, was the actual skull of poor old Lambert. Grim image or not it was all very impressive. And all was totally accessible, ramps and even a lift to the top floor! If a medieval cathedral can do it, why not the Tourist Office? 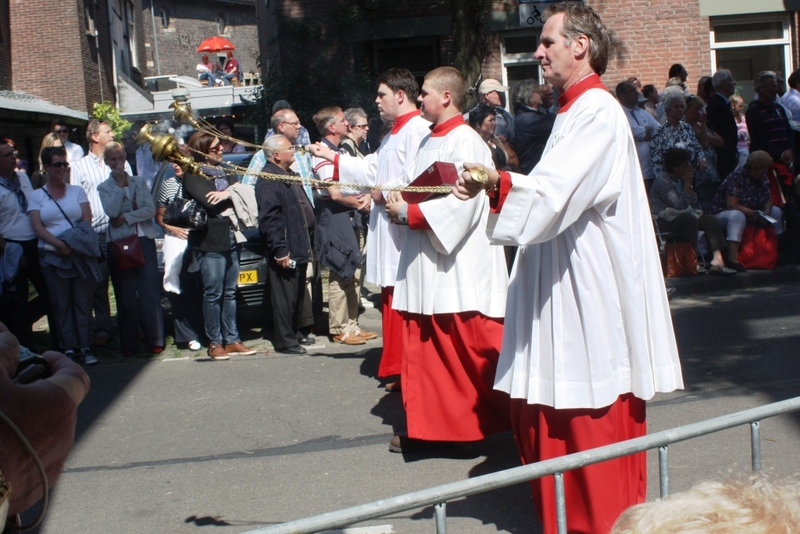 Due to all kinds of battles and political intrigues over hundreds of years, there’s a bulge at the bottom of the Netherlands where it intrudes into Belgium and is squeezed up against Germany and not so far from Luxemburg – and here lies Maastricht. The marina we moored at here had in years gone by been a thriving commercial barging port. trendy office space. There were few locals about, but nearby the scene was very different. scooters and wheelchairs buzz about particularly on the huge network of cycleways giving users heaps of freedom. There were masses of great shops – though we weren’t there to buy – and wide courtyards everywhere full of outdoor dining tables all packed with people enjoying lunch, dinner, a coffee, a drink or unfortunately, occasionally a cigar. 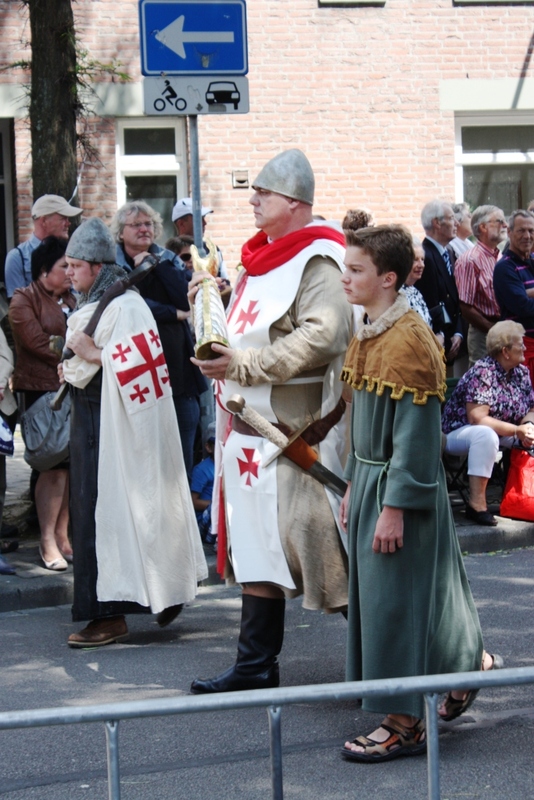 Along the narrow streets flying from the ancient buildings there were banners featuring what looked like the head of a bishop but we didn’t give them a second thought – until on the Sunday afternoon we detected that something “big” was about to commence. Having a drink at a table which, it turned out, was right beside the big event, we learnt that a once in seven years procession of all the relics and treasures in five or more of the biggest and oldest cathedrals, basilicas, abbeys and churches in town was about to begin. Had we not stumbled on the Treasury in Liege this would have made little sense to us. 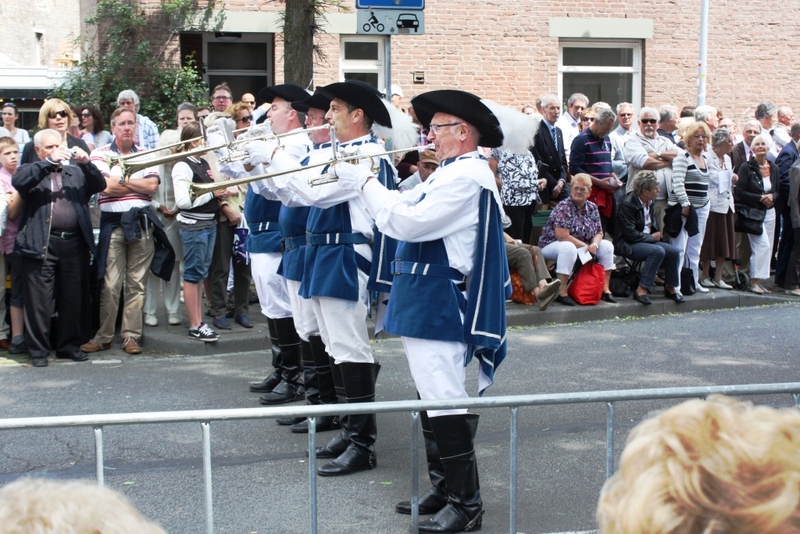 With a fanfare from historically dressed trumpeters the procession commenced right beside us. More drama.. and note the street cleaner in contemporary dress sweeping up behind the horses! Men in ancient robes paraded relics. Brass bands marched. Actors performed sections of relevant old plays. 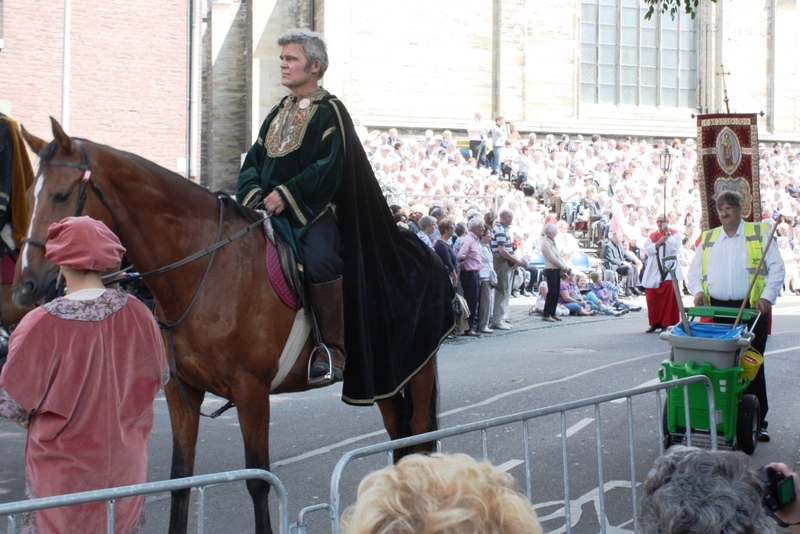 Bishops, other church dignitaries, horses (each followed by its personal street sweeper), carts and carriages all marched along while we and hundreds of others applauded. 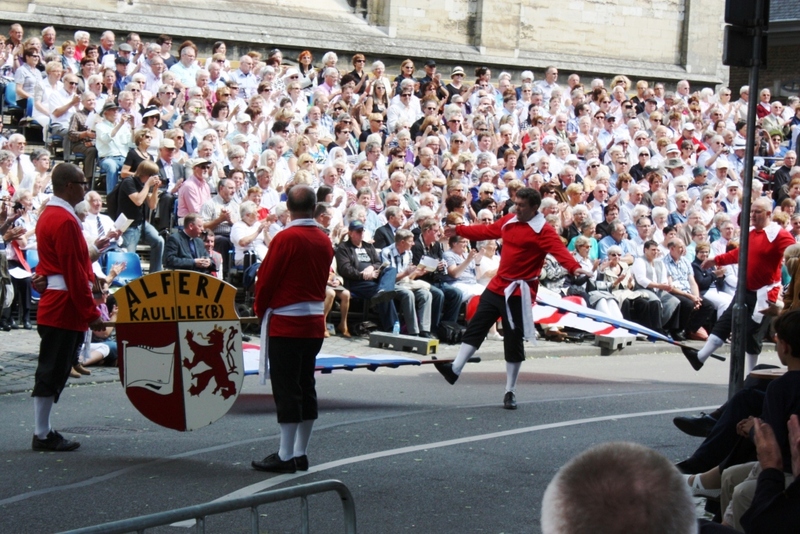 Skipping over banners at the procession. learnt from a running commentary in Stewart’s ear from a helpful local. What a day that turned out to be. 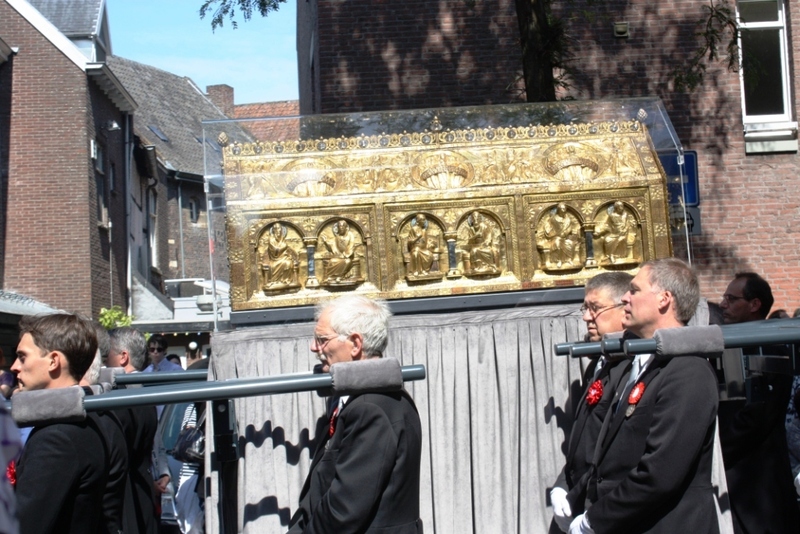 The gold cask containing the most precious relics ends the procession. 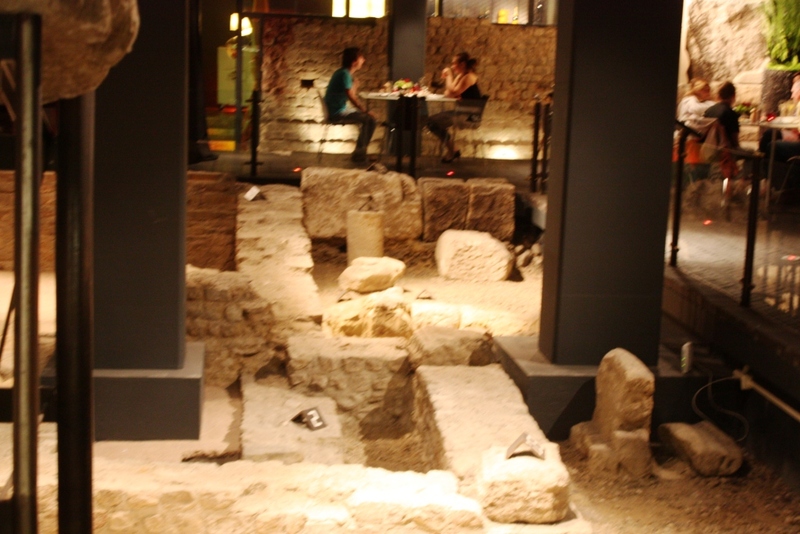 Still in Maastricht, someone, somewhere had mentioned that the remains of a Roman road, temple and well, and perhaps even more relics, were preserved and on view downstairs in a trendy little hotel in the centre of town. It was easy to find the hotel, The Derlon, but no mention anywhere outside of what might be found in its basement – anyway large pot-plants blocked wheelchair entrance at the front door. Just to make sure we hadn’t misread the article, Lesley bounced in and inquired at reception if they knew anything about Roman ruins. Brunch amongst the Roman ruins. “Yes of course!” said the lady behind the desk, “there’s a lift to the breakfast room and you’re welcome to go down and take a look.” The receptionist pushed the pots out of the way and soon we were down in Maastricht 100BC! often do, we went back to the Tourist Information Office to tell them of our wonderful find and suggested they add it to their list of what wheelchair users can see in this great city. our Skype calls is its own challenge! 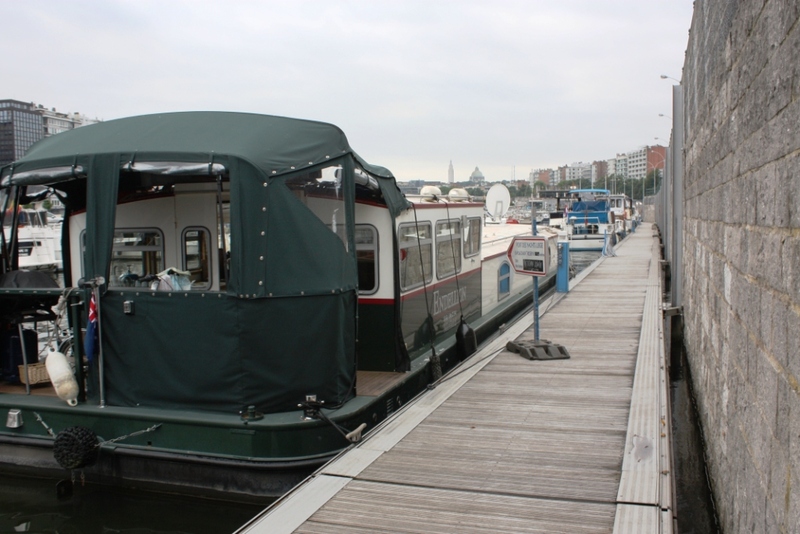 This entry was posted in Accessibility, History, Waterway life, Waterway services and tagged Endellion barge, Facts and figures, Travel, Waterway services, Wheelchair access. Bookmark the permalink. 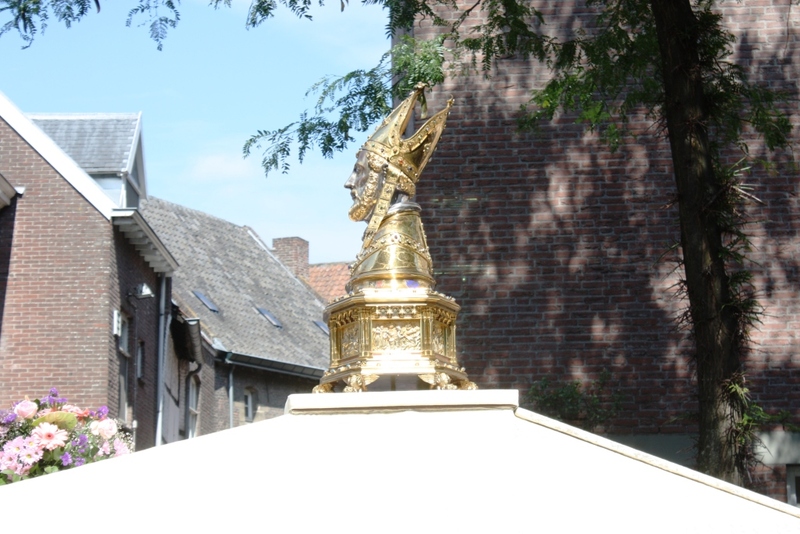 4 Responses to July journey into the Netherlands: a story of old relics. Hi Marian .. so lovely to hear from you and we hope you like the photo! It really was so wonderful to meet you both and we hope to see you again when we’re heading your way. We will be in touch. I want to go to Maastricht! What a fabulous sounding place. But I don’t envy you that trip up the ramp Stewart. No wonder you only did it once. How did you get back to the boat?